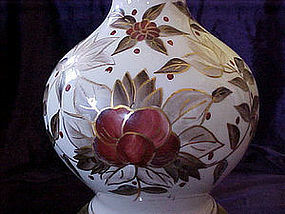 Hand painted floral lamp sits atop a modest brass base and is 21" to the top of the socket. 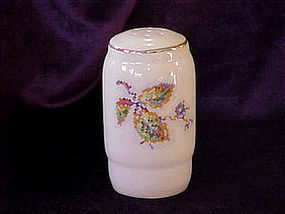 Nice creamy colored porcelin with painted florals, in rusts, browns ,and lots of gold trim. The florals are large and simplistic. A very grand lamp, in very good condition. No cracks, chips or repairs. You will need to get your own shade.Email me if you would like to see full view photo. 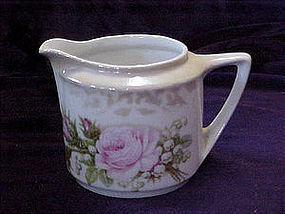 Large germany cream pitcher with light pink rose transfer. 3 1/2" tall. Marked with a stamp with 3 crowns. Its hard to read_?__crown china Germany. It also has these ingraved into the porcelin under the glaze 34. 373/1 1/2. I can tell its very old. There are no damages to it, it's in very nice condition! 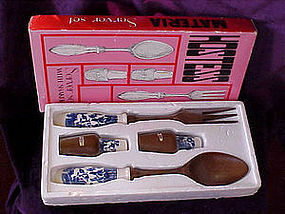 Vintage Blue Willow hostess server set in original box. Set includes salad fork, salad spoon, and salt & pepper shakers. Set is made of the syrocco material but shaker tops and utinsil handles are porcelin with the blue willow pattern. 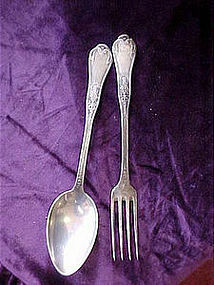 Fork and spoon measure 10 1/4" long. Original packing inside box also. 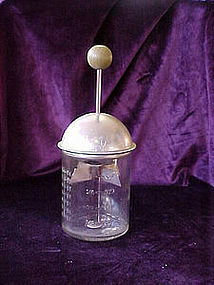 Nice old food chopper,glass,with embossed measurements. It has a dome shaped aluminum top with a green wooden ball for the top of the plunger. A typical old style "onion chopper". It measures 8 1/4" tall and says DISPENSERS INC Los Angeles-New York on the bottom of the glass.Nice condition, no chips or cracks. 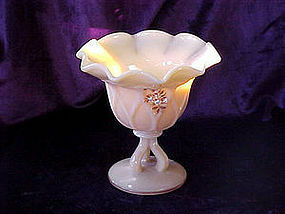 Pretty little light carmel slag color with hand painted flowers in white & brown. The white lines in the slag are faint and few, almost a solid carmel color. The dish is flared and fluted at the top and sits on a pedestal wit a 3 leg stem. unusual and unique.Westmoreland mark on bottom.Stands 5 1/4" tall. Excellent condition. 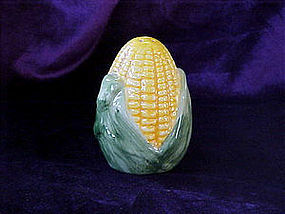 Single corn shaker. Measures 3 1/4" tall, and on the squatty side. This is NOT Shawnee I'm not sure what company made it, its not marked, it's newer.hand painted. Good condition, with plastic stopper. This is the possible mate to yours! 3 holes in top. These old shakers are from the 40s & 50s most likely. They are 3 3/4" tall, clear quilted glass bottoms with yellow plastic tops. They are in good condition with no damages. Tops are good too. I have a red set availiabe just like these, also. I believe it is a Crooksville piece. It is a petit point needlepoint design with a gold trim on the top. It measures 4" tall and has 7 holes in the top. Some wear on the gold trim. light crazing, missing cork, no damages. Perfect if you are looking for that missing shaker! Tall elegant filligree look porcelin shakers are completely covered in 22kt gold. They stand at 5" tall. Thes match well with any patttern of gold trimmed dinnerware. They have an allover pitty type pattern(hard to describe) see photo. A very nice shape shaker on a footed base. Made in Japan, red stamp, orignal stopper/corks. I have another set similar, same pattern and texture, but different shape. This pair is in excellent condition also. 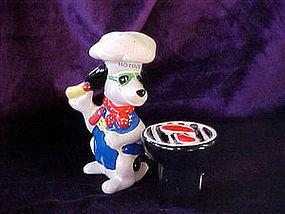 This little hound dog sports a chef hat and apron. He holds a hot dog in one hand and his bar-b-que fork in the other, while he watches his steaks grilling on the bar-bee. A cool little pup behind those dark sunglasses! He stands almost 5" while his grill is about 2". A very novel little shaker set. Excellent condition with stoppers intact. These elegant shakers would look beautiful with any of the older 22kt trim dishware. 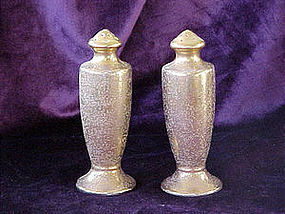 They stand 5" tall and are a solid overall 22kt gold over porcelin, with an overall pitted style design (hard to describe) See photo. They have the red stamp "made in Japan". They have a slender shape with mushroom style tops. Excellent condition.They have the original rubber w/cork stoppers. 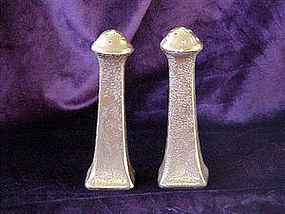 Rosevine salt & pepper shakers. 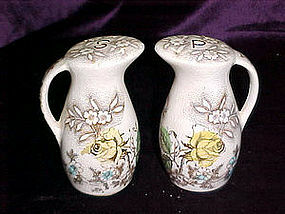 Shaped like pitchers, they have a large allover chintz style. Decorated in browns,over ivory with a splash of green and rose watercolor. These are wonderful additions if you are completing the dinnerware set. They are about 3 3/4" tall. Very good condition, minor crazing shows age. No chips cracks, yellowing or repairs. 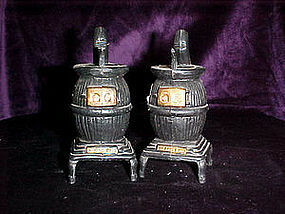 Little black pot bellied stoves, make cute salt & pepper shakers. They are plastic, stand about 4" tall and are trimmed in a gold paint. One of the plastic stoppers is missing.Otherwise good condition. Santa head shakers. 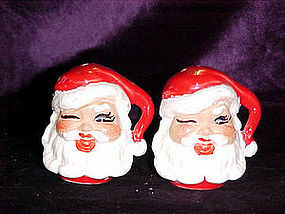 2 1/2" red & white decorated, winking santas. Cute pair. Signed "garnet" in the ceramic under the glaze. Nice condition, but no corks. Pottery drip glazed shakers. 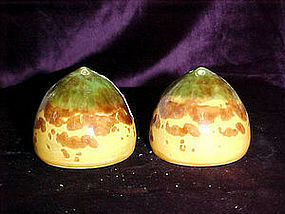 These are a flat egg shape with a green & brown drip glaze over yellow. Must see picture. Very nice condition except corks are missing. 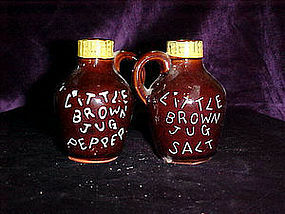 Little brown jug salt, and little brown jug pepper. Made of the red clay ceramic with the brown glaze and cold paint decorations. They stand about 3 1/4" tall and all the paint is still nice, and the corks are still there. Stamped Japan in gold on back. 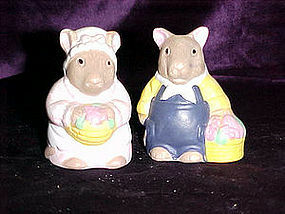 Mr & Mrs Mouse have been to the market! Cute pair of shakers. She is dressed with apron and hat, holding a basket full of goodies, He is dressed in his best overalls and white neck kerchief holding a basket full of goodies also. They are about 2 3/4" tall. Newer I'm sure, but a nice heavy porcelin. Plastic stoppers.